Today, mouflon inhabit the Caucasus, Anatolia, northern and eastern Iraq, and northwestern Iran and Armenia. The range originally stretched further to the Crimean peninsula and the Balkans, where they had already disappeared 3,000 years ago and came back to Bulgaria. Mouflon were introduced to the islands of Corsica, Sardinia, Rhodes, and Cyprus during the neolithic period, perhaps as feral domesticated animals, where they have naturalized in the mountainous interiors of these islands over the past few thousand years, giving rise to the subspecies known as European mouflon (O. aries musimon). 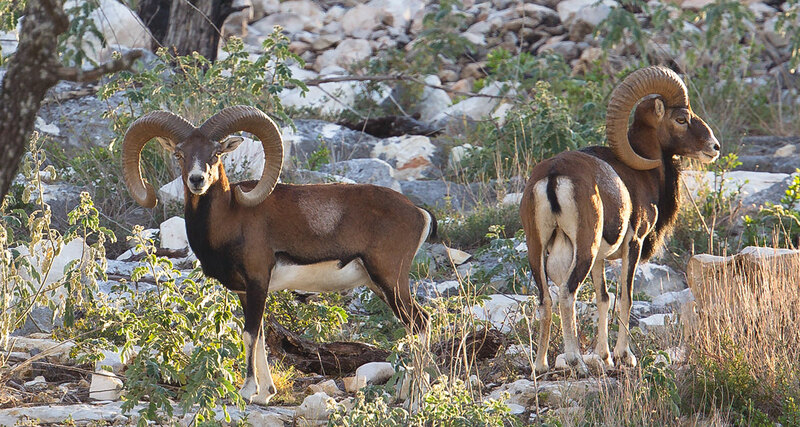 On the island of Cyprus, the mouflon or agrino became a different and endemic subspecies only found there, the Cyprus mouflon (O. o. ophion). The Cyprus mou on population contains only about 3,000 animals. They are now rare on the islands, but are classified as feral animals by the IUCN. They were later successfully introduced into continental Europe, including Portugal, Spain, France, Germany, central Italy, Switzerland, Austria, the Netherlands, Belgium, the Czech Republic, Poland, Slovakia, Slovenia, Hungary, Bulgaria, Romania, the Canary Islands, and even some northern European countries such as Denmark, Sweden and Finland. A small colony exists in the remote Kerguelen Islands in the southern Indian Ocean, and on the Veliki Brijun Island in the Brijuni Archipelago of the Istrian Peninsula in Croatia. In South America, mouflon have been introduced into central Chile and Argentina. Since the 1980s, they have also been successfully introduced to game ranches in North America for the purpose of hunting; however, on game ranches, purebreds are rare, as mou on interbreed with domestic sheep and bighorn sheep. Mouflon have been introduced as game animals into Spieden Island in Washington state, and into the Hawaiian Islands of Lanai and Hawaii where they have become a problematic invasive species. A small population escaped from an animal enclosure owned by Thomas Watson, Jr. on the island of North Haven, Maine in the 1990s and still survives there. Their normal habitats are steep mountainous woods near tree lines. In winter, they migrate to lower altitudes.